Thomas Struth, Pantheon, Rome (1990); chromogenic print, 179.2 x 233.7 centimeters. Courtesy of the artist. Something strange happens in these photographs. They are vast—the prints take up several square feet of a wall and also depict immense space—yet the figures in them seem both near and distant. They are distant because of their scale; near because Thomas Struth’s large-format photographs beckon us closer, until we feel almost a part of the space he has captured. The feeling falls just short of full immersion by the curious sensation that the people peppered throughout will be forever further than they appear. This seesawing experience of space is Struth’s way of ordering things, holding them ever at a distance, and in the relationship between people and architecture, space and its inhabitants, he portrays humanist transcendence. Stone by stone, the Pantheon’s dome mimics the shape of the heavens, until it narrows into the oculus through which a beam of light falls into the temple. The philosopher O. F. Bollnow describes the Pantheon’s interior space as one where “the outside world seems to be cut away and the sky looks in from above through one great eye.” In such a space, he writes, “Man feels entirely collected within himself, because the view of the visible world is forbidden to him, and nevertheless a piece of infinity always remains present.” In Struth’s Pantheon, Rome (1990), spectators congregate in the center of the Roman temple, beneath the oculus, with their heads back, arching their bodies into poses of supplication beneath the immensity and incomprehensibility of the skies. They are statuesque under this view of the heavens, and yet the oculus itself—the cause of this strange stillness—is omitted from Struth’s composition. This is a clue. Architecture is the art of directing movement through space, but the Pantheon halts movement with “a piece of infinity” that fills visitors with awe. By omitting the defining architectural feature, we see only its effect, and are left to conclude that the sensations of stasis and infinitude, human intimacy and anonymity, are caused not by the Pantheon, but by Struth’s camera lens. They are frozen not because of the oculus, which remains out of view, but by Struth’s camera. All frames, according to Bollnow, isolate and idealize parts of the world. In this sense, Struth’s camera functions in the same way as the Pantheon’s eye. The Pantheon’s oculus also mimics the camera lens—a hole that lets light through to freeze what or who’s in the light. It is not simply a recording eye, but rather creates an idealized space seen from an omniscient vantage point from which the subject matter becomes immersive yet remains at a distance. The effect is that the photographs order the relationship between people and the spaces they’ve constructed, both inside the photograph, and in the gallery space where it hangs. Some of his most compelling images show people inside architectures from a distant past, their awkward bodies learning how to move around these unfamiliar yet carefully designed spaces. The large-format camera is essential to Struth’s work. One of the defining characteristics of this format is that it flattens the perimeters of the frame while simultaneously maintaining a wide-angle field of view. This means that the subject matter at the edges of the frame, even though physically nearer to the camera, is pushed deeper into the picture; the space is ordered into vertical planes, with distinct separation between foreground, middleground, and background. Struth’s wide-angle lens creates a cool distance between the viewer and the figures that recede into the picture. This formal strategy is common to many photographers of the Düsseldorf School, and was first brought to bear on architecture by Struth’s teachers, Bernd and Hilla Becher. The Bechers arranged photographs of buildings into square grids, which they called typologies. This arrangement, they believed, gave sense to the common characteristics of a particular category of architecture or space. Their typologies were purposefully austere, recalling blueprints, and invoked contemplation rather than immersion. Like the Bechers, Struth’s images are specimen-like, as if his camera were a microscope turned toward a spider and its web. 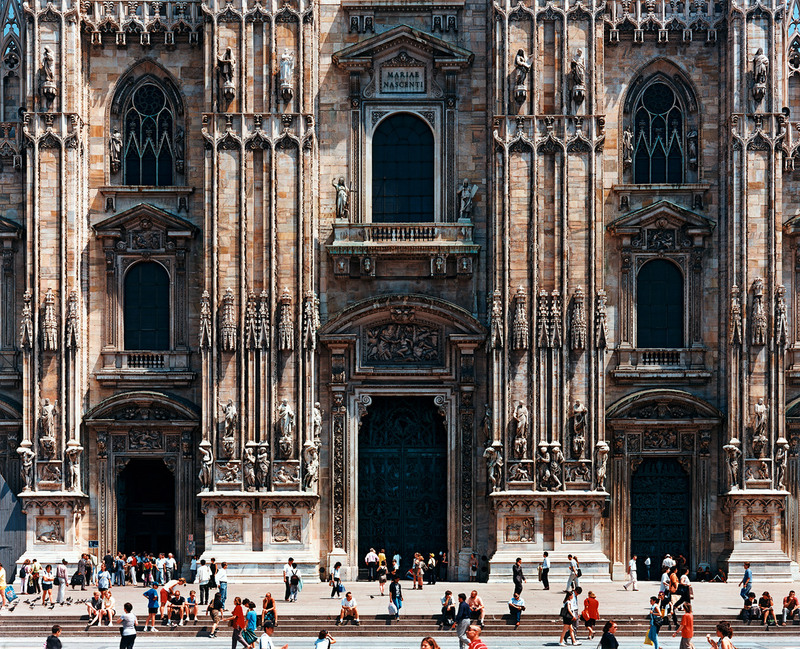 Thomas Struth, Milan Cathedral, Milan (1998); chromogenic print, 183.4 x 229.6 centimeters. Courtesy of the artist. It’s no coincidence that much of Struth’s early series focused on temples, museums, and other places of worship. In Pantheon, Rome, we see how people interact within devotional space, but in Milan Cathedral (façade) (1998), we see how the space itself is constructed for worship. A myriad milling tourists move about the steps leading into the cathedral, but they only compose a small portion of the photograph. The weight of a Perpendicular Gothic cathedral—designed with an emphasis on vertical lines—bears down from above. The stone saints who appear on the façade are stoic, transcendent in contrast with the humans below. If Struth’s Pantheon photograph allows viewers to feel a sense of order, his image of the Milan Cathedral captures a monument in which people might lose themselves and find inspiration. Struth has said that his images are not religious or devotional, but that his interest is in “the relationship between an individual’s existence and the community of larger social entities.” They are also deeply humanistic. Struth’s work reflects that the transcendent sensation often confused with religious experience is little more than a byproduct of the interplay between the chaos of life, and the stoic organization of space. Otto Friedrich Bollnow, Human Space (London: Hyphen Press, 2001), 153. “Thomas Struth Interview,” Time Out London, May 12, 2015. Accessed December 22, 2015, http://www.timeout.com/london/art/thomas-struth-interview.